For another year, executions and death sentences remained historically low while public support for the death penalty dipped to its lowest level in 45 years. These findings from the Death Penalty Information Center’s (DPIC) recently released year end report also include that eight states carried out 23 executions, half the number of seven years ago, and the second lowest total since 1991. Only 2016’s numbers were lower with just 20 executions. 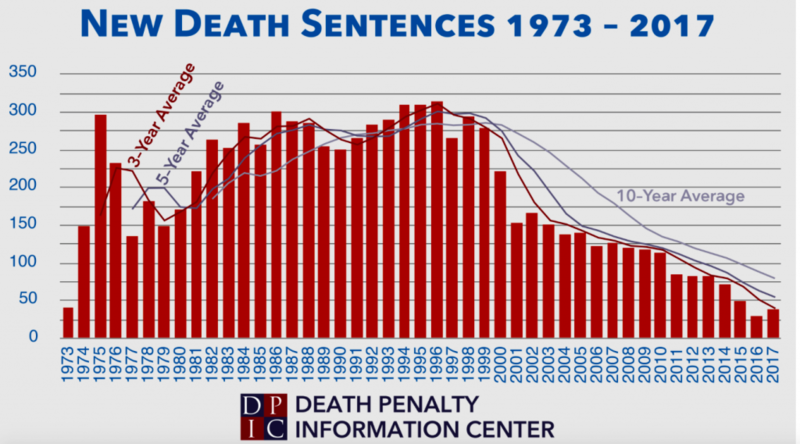 Fourteen states and the federal government will likely impose 39 new death sentences by year’s end, the second lowest annual total since the U.S. Supreme Court declared the death penalty unconstitutional in 1972. Your support of TADP’s work in Tennessee is contributing to this changing view of the death penalty. TADP is educating Tennesseans from Memphis to Kingsport about the many reasons that the death penalty system cannot be trusted. From systemic problems with racial discrimination and lack of access to effective representation to the system’s exorbitant financial cost to taxpayers and emotional cost to victims’ families to the ongoing risk of wrongful conviction, the state’s death penalty system is broken beyond repair. The DPIC report highlights the continued risk of executing the innocent as one of the key factors behind the public’s decrease in support for the death penalty. According to the Gallup poll, public support for the death penalty dropped by five percent in 2017, and Republicans registered a 10-percentage point drop since last year. This year’s 55 percent support marks the lowest level since 1972, just before the U.S. Supreme Court ruled the nation’s death penalty laws unconstitutional. With your support of TADP, we will keep this trend moving in the right direction. Every dollar you invest allows us to get out this message of a broken system to more Tennesseans and to give them the tools to educate others, including lawmakers, about why our state can do better. Please consider an investment in TADP and in the work to end the death penalty in our state. Happy Holidays from all of us at TADP! Read the DPIC report here.